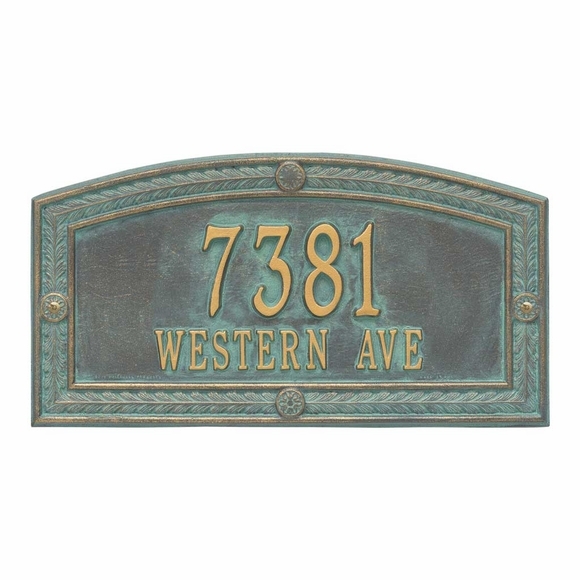 Hamilton Address Plaque with Ornate Border - - 17" x 9" personalized address sign. Wall mount or lawn mount with purchase of optional lawn stakes. Made in USA. Elongated arch shape accentuates the unusually wide and highly detailed border. The final finish is brushed by hand to enhance each detail (enlarged in the last two small images). Holds a one-line address or two-line address. The one-line sign holds up to five (5) 4" numbers. The two-line sign holds up to five (5) 3" numbers on Line 1 and up to seventeen (17) 1.25" characters on Line 2. It is not necessary to use both lines. For a one-line sign, please leave the Line 2 input box empty. Colors: AC antique copper, BG black/gold, BS black/silver, BV bronze/verdigris, OB oil rubbed bronze, OG bronze/gold. Large image shown in upscale bronze verdigris. Smaller images (from left to right): antique copper, black/gold, black/silver, bronze/verdigris, oil rubbed bronze, and bronze/gold. Dimensions: 17"W x 9"H x .375". Elongated arch shape accentuates the unusually wide and highly detailed border. Wall or lawn mount. Proudly hand crafted in the USA.